Over 90% of alcohol consumed is oxidized in the liver; much of the remainder is excreted through the lungs and in the urine. Two major pathways of alcohol metabolism to acetaldehyde have been identified. Acetaldehyde is then oxidized by a third metabolic process. Figure: Metabolism of ethanol by alcohol dehydrogenase and the microsomal ethanol-oxidizing system (MEOS). Alcohol dehydrogenase and aldehyde dehydrogenase are inhibited by fomepizole and disulfiram, respectively. 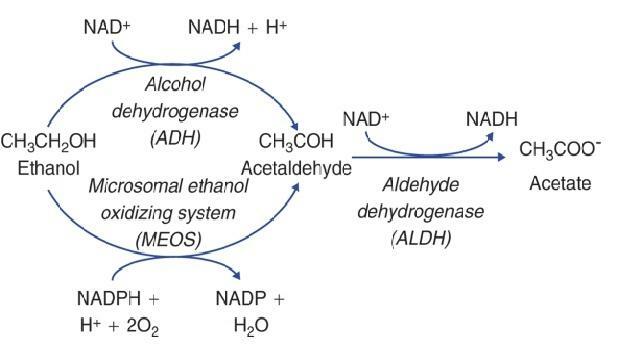 The primary pathway for alcohol metabolism involves alcohol dehydrogenase (ADH), a cytosolic enzyme that catalyzes the conversion of alcohol to acetaldehyde. This enzyme is located mainly in the liver, but it is also found in other organs such as brain and stomach. oxidation generates an excess of reducing equivalents in the liver, chiefly as NADH. Another pathway is the Microsomal Ethanol Oxidizing System (MEOS). It uses NADPH as a cofactor in the metabolism of ethanol. At blood concentrations below 100 mg/dL (22 mmol/L), the MEOS system, which has a relatively high Km for alcohol, contributes little to the metabolism of ethanol. 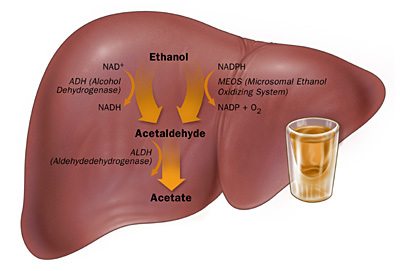 However, when large amounts of ethanol are consumed, the alcohol dehydrogenase system becomes saturated owing to depletion of the required cofactor, NAD+. As the concentration of ethanol increases above 100 mg/dL, there is increased contribution from the MEOS system, which does not rely upon NAD+ as a cofactor. consumption results in significant increases not only in ethanol metabolism but also in the clearance of other drugs eliminated by the MEOS system. catalyzed by mitochondrial NAD-dependent aldehyde dehydrogenase. The product of this reaction is acetate which can be further metabolized to CO2 and water. GENEPY: DAMAGE SPIRITS OR BENEFITS OF A PLANT ALPINA? The master or central circadian clock (i.e., “pacemaker”) is located in the suprachiasmatic nucleus (SCN) in the anterior hypothalamus in the brain. The SCN is regulated by light stimulating retinal ganglion cells in the eye and it is by this mechanism that light directs central circadian rhythms. Circadian rhythms are found in nearly every cell in the body, including the periphery, encompassing the immune system, heart, adipose tissue, pancreas, and liver . The SCN synchronizes circadian rhythms found in the periphery via several mechanisms, including communication with nerve cells that influence visceral functions such as digestion, heart rate, etc., via direct release of the hormones oxytocin and vasopression into the general vasculature or indirectly via release of local signals that affect the release of hormones from the anterior pituitary gland. 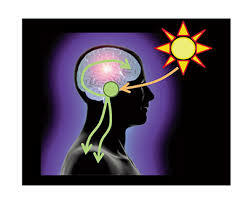 In addition, peripheral circadian rhythms can be regulated by external factors other than central light-entrained rhythms. For instance, abnormal feeding patterns can cause peripheral circadian rhythms to become misaligned with central rhythms if feeding is out of synch with the normal 24-hour pattern, a phenomenon that can be observed in both animals and humans. Peripheral tissues express self-sustained rhythms that are able to function independent of the central clock in the SCN. For example, following SCN lesion that terminates central circadian rhythmicity, peripheral circadian clocks continue to demonstrate rhythmicity; however, peripheral rhythms become desynchronized from each other over time. This internal misalignment is particularly detrimental because peripheral circadian clocks directly regulate up to 5 to 20 percent of the genome. Furthermore, reports indicate that 3 to 20 percent of the entire genome demonstrates 24-hour oscillations in gene expression, including genes critical for metabolic processes. This observation suggests that although not directly controlled by the circadian clock, genes are influenced as a consequence of rhythmic changes in transcription factors and transcriptional and translational modifiers. The suprachiasmatic nucleus (SCN) is the central circadian pacemaker. The SCN is located in the hypothalamus and is regulated by light signals from the eye. The SCN then affects a wide variety of physiological and behavioral outcomes. The molecular circadian clock consists of transcriptional activators and repressors—that is, proteins that stimulate and repress the production of proteins, respectively, in a cyclic process that is approximately 24-hours in duration. The molecular circadian cycle is initiated when the transcriptional activators Clock and Bmal1 combine to stimulate the transcription of target circadian genes including period (Per) and cryptochrome (Cry) (i.e., Per1 to Per3 and Cry1 and Cry2) as well as a host of other clock-controlled genes. When PER and CRY proteins accumulate in the cytosol, they heterodimerize and translocate to the nucleus where they act as transcriptional repressors to terminate CLOCK-BMAL1–mediated transcription, thus ending the molecular circadian cycle. The cycle is further regulated by additional proteins, including the enzyme sirtuin 1 (SIRT1), a histone deacetylase that modifies circadian proteins or DNA by removing acetyl groups to alter gene expression. SIRT1 is sensitive to levels of the coenzyme nicotinomide adenine dinucleotide (NAD+), making NAD availability a potential regulator of the molecular circadian clock. The image above shows the molecular circadian clock. Transcription of the clock-controlled genes, including Per and Cry is initiated by the heterodimerization and binding of BMAL1 and CLOCK (the positive limb of the molecular circadian clock). Once sufficient amounts of PER and CRY have been produced, they dimerize and inhibit further BMAL1/CLOCK-mediated transcription (the negative limb of the molecular circadian clock). The changes observed in the behavioral and biological systems also are observed on the molecular level as a disrupted molecular circadian clock, an effect that is evident both in vitro and in vivo. Exposure of intestinal epithelial cells to alcohol increases the levels of circadian clock proteins CLOCK and PER2 . Likewise, alcohol-fed mice have disrupted expression of Per1–Per3 in the hypothalamus, human alcoholics demonstrate markedly lower expression of Clock, BMAL1, Per1, Per2, Cry1, and Cry2 in peripheral blood mononuclear cells compared with nonalcoholics, and in humans alcohol consumption is inversely correlated to BMAL1 expression in peripheral blood cells. The alcohol-induced changes seem to have long-lasting effects on the circadian clock, particularly when the exposure occurs early in life, which may be the consequence of epigenetic modifications. For example, neonatal alcohol exposure in rats disrupts normal circadian-clock expression levels and expression patterns over a 24-hour period. These examples illustrate the ability of alcohol to have profound and long-lasting effects on clock-gene expression in multiple organs and tissues. The mechanisms by which alcohol disrupts circadian rhythmicity are likely a consequence of alcohol metabolism and alcohol-induced changes in intestinal barrier integrity. Alcohol is metabolized via several mechanisms, including the enzymes catalase, alcohol dehydrogenase (ADH), and cytochrome P450 (CYP2E1). Although alcohol metabolism most prominently occurs in the liver, other tissues such as the stomach, intestine, and brain also play a role in this process. One consequence of alcohol metabolism that is particularly relevant for alcohol-induced disruption of circadian rhythmicity is a shift in the cellular NAD+/NADH ratio. SIRT1, which regulates the molecular circadian clock, is highly sensitive to the cellular NAD+/NADH ratio. Therefore, a perturbation in the availability of NAD+ (as a consequence of alcohol metabolism by ADH or as a consequence of aldehyde metabolism by acetaldehyde) would be one mechanism by which alcohol could disrupt the molecular circadian clock and resulting circadian rhythms. Another mechanism by which alcohol can exert a negative influence on circadian rhythmicity is by promoting intestinal hyperpermeability. Alcohol disrupts intestinal barrier integrity in vitro, in rodents , and humans. Intestinal hyperpermeability allows luminal bacterial contents such as endotoxin to translocate through the intestinal epithelium into the systemic circulation. Endotoxin can disrupt circadian rhythms. LPS administered to rodents impairs the expression of Per in the heart, liver, SCN, and hypothalamus and suppresses clock gene expression in human peripheral blood leukocytes . Thus, intestinal-derived LPS may be one mechanism by which alcohol disrupts circadian rhythmicity. In addition, LPS elicits a robust immune response in the periphery, and systemic inflammation disrupts normal circadian rhythmicity. Thus, there are several plausible mechanisms by which alcohol-induced effects on the intestine may disrupt central and peripheral circadian rhythms. Most studies of alcohol’s effects on human circadian rhythms have been conducted in chronic alcoholics undergoing alcohol abstinence and associated withdrawal. Several studies of abstinent alcoholics during acute and/or longer term alcohol withdrawal have reported abnormalities in the amplitude, timing, and/or patterning of circadian rhythms. Reported withdrawal-associated effects on circadian rhythms include phase-advances (i.e., earlier timing) of circadian rhythms in body temperature , rapid-eye-movement (REM) sleep, and levels of 5-hydroxyindoleacetic acid (5-HIAA, the primary metabolic by-product of serotonin, an important chemical involved in communication among nerve cells). In contrast, however, phase delays (i.e., later timing) have been described for circadian rhythms in blood cortisol, a key stress hormone. In addition, circadian patterns of both cortisol and melatonin (a hormone involved in sleep and circadian rhythm regulation) may be severely blunted or even completely abolished during alcohol withdrawal. In the context of alcoholism, disrupted circadian rhythms may create a positive feedback loop that markedly exaggerates alcohol-induced immune/inflammatory-mediated diseases by (1) negatively influencing immune function and (2) promoting alcohol consumption that leads to further circadian-rhythm disruption. These changes are highly relevant because circadian-rhythm disruption has a substantial impact on immune function, which in turn has important implications for a wide variety of pathological conditions, including metabolic syndrome. A better understanding of the mechanisms by which circadian disruption affects health outcomes such as cancer, inflammation, metabolic disease, and alcohol-induced pathology is critical. This information may lead to the development of chronotherapeutic approaches to prevent and/or treat a wide variety of conditions that are promoted or exacerbated by circadian- rhythm disruption and may lead to better risk stratification for individuals who are at risk for developing chronic conditions. ETHANOL EFFECTS ON THE NERVOUS SYSTEM. Ethanol have several effects on the Nervous System, like difficulty walking, blurred vision, slurred speech, slowed reaction times, impaired memory. These effects usually disappear when drinking stops. In other hand, people, who have been drinking heavily for long time, can have brain deficits even after he achieves the sobriety. * his or her general health status. As we can see in Acute effects of ethanol on Glutamate Receptor, 2012 ethanol inhibits the function of glutamate NMDA (N-methyl-D-aspartic acid) receptor . It seems this effect happens in restricted cerebral areas such as hippocampus, amygdala and striatum. Inhibition requires high concentration of ethanol. This can explain why a person, who has a severe intoxication of alcohol, has impairments of motor performance and memory. NMDA receptors become a major contributor to acute ethanol intoxication effects, with ethanol acting like an antagonist to the Glutamate and inhibiting the receptor. Timing-dependent reduction in ethanol sedation and drinking preference by NMDA receptor co-agonist d-serine, 2012 shows that the NMDA receptor has a co-agonist site which binds endogenous amino acids glycine and d-serine. Administration of 2.7 g/kg of d-serine before injection of ethanol (3 g/Kg) in mice, prolonged latency to a loss of righting reflex (LoRR) and shortened LoRR duration. Analysis of blood samples reveals no effect of d-serine on ethanol concentration but an ethanol-induced decrease of L-serine and glycine content was prevented by acute d-serine pre-administration. After a week of daily injections, mice treated with d-serine shows a 50% decrease in free choice ethanol, compared to a control group (saline-injections). New studies reveals that alcohol influence the glutamatergic transmission also throw the AMPA (α-amino-3-hydroxyl-5-methyl-4-isoxazole-propionate) receptors. AMPA receptor interacts with Neuronal activity dependent pentraxin (Narp). According to Ethanol up-regulates nucleus accumbens neuronal activity dependent pentraxin (Narp), implications for alcohol-induced behavioral plasticity, 2012 injection or ingestion of alcohol up-regulated accumbens Narp levels and levels of GluR1 AMPA receptor subunit. Narp Knock-Out Mice fail to escalate daily intake of high alcohol concentrations under free-access conditions and shift their preference away from high alcohol concentrations with repeated alcohol experience. Narp deletion does not influence other behavior such as food or water intake, alcohol-induced motor activity. Ethanol-induced up-regulated Narp expression may be important for neuroplasticity withing limbic subcicuits mediating or maintaining the reward properties of alcohol. How the neuromolecular actions of ethanol can be translated to its observed intoxicating effects? A possible answer is given by the study of Ehlers, Wills, Havstad, Ethanol reduces the phase locking of neural activity in human and rodent brain, 2012 It seems that ethanol is related to a significant reduction in phase locking, synchrony of phase of event-related oscillations, withing and between brain sites. Anyway, this argument remains poorly understood. Studies in 1997 already showed the interaction between alcohol and GABAA-receptor . 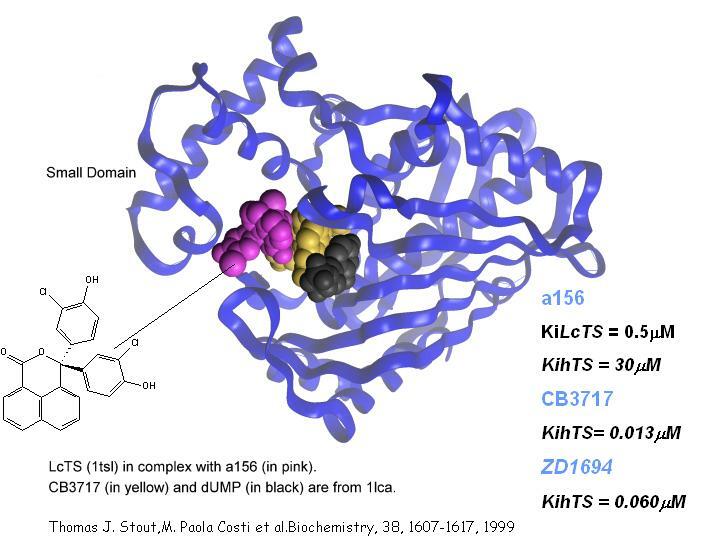 Sites of alcohol and volatile anaesthetic action on GABA A and glycine receptors, Nature, 1997 identified a region of 45 amino-acid residues that is both necessary and sufficient for the enhancement of receptor function. Within this region, two specific amino-acid residues in transmembrane domains 2 and 3 are critical for allosteric modulation of both GABAA and glycine receptors by alcohols. According to The role of GABAA receptors in mediating the effects of alcohol in the central nervous system, 2003 there is a large body of evidence showing that GABAA receptors play central roles in both the short- and long-term effects of ethanol in the CNS. 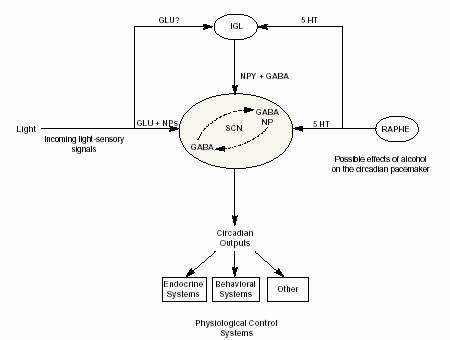 When GABAA receptors are acutely exposed to ethanol, there is a potentiation of GABA-gated current (influx of chloride ions into the postsynaptic cell, greater hyperpolarization and a further decrease in neuronal excitability). The article shows also that there is strong evidence that GABAergic systems are involved in mediating self-administration of ethanol in animal models, likely by stimulating reward circuitry in the mesolimbic system. There is a correlation between compounds that activate or potentiate GABAergic systems and increased ethanol intake. The reverse is true for compounds that block or inhibit GABAergic systems, like benzodiazepine antagonist Ro15–1788 as we can see in Alcohol-sensitive GABA receptors and alcohol antagonists, 2006 . There are also evidence of a potentiation on ethanol effects after long-term exposure, due to higher expression in GABAA receptor subunit mRNA and in alteration of several intracellular proteins, such as protein kinase C (PKC). In brain tissue from mice lacking PKCε, GABA receptors are highly sensitive to allosteric modulation by ethanol, twice the potentiation compared with controls. Ethanol can damage the brain even indirectly. Large amounts of alcohol for long periods lead to a poor general health status or to severe liver disease. Thiamine (Vitamin B1) deficiency is a common consequence of alcoholism. Thiamine is found in foods such as meat and poultry; whole grain cereals; nuts; and dried beans, peas, and soybeans. Most people consume sufficient amounts of thiamine in their diets. The typical intake is 2 mg/day; the Recommended Daily Allowance is 1.2 mg/day for men and 1.1 mg/day for women. Thiamine deficiency can lead to serious brain disorders such as Wernicke–Korsakoff syndrome (WKS). WKS is a disease that consists of two separate syndromes, a short–lived and severe condition called Wernicke’s encephalopathy and a long–lasting and debilitating condition known as Korsakoff’s psychosis. The symptoms of Wernicke’s encephalopathy include mental confusion, paralysis of the nerves that move the eyes and difficulty with muscle coordination. Many Wernicke’s encephalopathy patients, however, do not exhibit all three of these signs and symptoms. 90 percent of alcoholics with Wernicke’s encephalopathy also develop Korsakoff’s psychosis, a chronic and debilitating syndrome characterized by persistent learning and memory (particularly anterograde amnesia) problems. The cerebellum appears to be particularly sensitive to the effects of thiamine deficiency and it is the region most frequently damaged in association with chronic alcohol consumption. Prolonged liver dysfunction, such as liver cirrhosis resulting from excessive alcohol consumption, can harm the brain, leading to a serious and potentially fatal brain disorder known as hepatic encephalopathy. Pregnant females who continue to drink alcohol can damage the baby causing the fetal alcohol syndrome (FAS). FAS infants may have distinct facial features, are markedly smaller than average, their brains may have less volume, and they may have fewer numbers of brain cells or fewer neurons that are able to function correctly, leading to long–term problems in learning and behavior. Also drinking in childhood or adolescence have effect on the growing brain. As we can see in A Mouse Model for Adolescent Alcohol Abuse: Stunted Growth and Effects in Brain, 2012 ethanol reduces the mass of the cerebral cortex, and in adults reduces the length of the corpus callosum. The short-term effects of ethanol administration is an augmented urine production, together with reduction of ADH (AVP) circulating levels and an increase in serum osmolality. This phase lasts for 2-3 hours, reaching a peak in urine production between the first and second hour after ethanol ingestion. Urine formation rate was increased from basal levels of 30-60 mL/h to mean values ranging between 113 and 373 (some of this results are not statistically relevant, see Excretion of alcohol and diuresis, 1990. ), while plasma osmolality increased from 280 to 330. Ethanol-induced diuresis was explained by the reduction of secretion of ADH from the posterior pituitary: this fact found strong evidence with experiments on the isolated hypothalamus of rat, which showed ethanol-dependent reduction of membrane permeability of the magnocellular Paraventricular Nucleus, responsible of ADH production and secretion. This alteration is due to the presence of ethanol-modulated channels, especially a K inward rectifier channel, inhibited by ethanol; this channels are almost insensitive to acetaldehyde, one of the major circulating ethanol metabolites. It is still unclear, but probably the ADH reduction is not the only significative mechanism involved. 3-4 hours after ethanol ingestion the rate of urine production strongly diminishes, reaching a minimum at 6-7 hours. This second phase is not only associated with augmented ADH secretion: various studies found simultaneous increase in the activity of the renin-angiotensin-aldosterone and hypothalamic-hypophyseal-adrenal axis. ANP levels don’t show significant differences in both phases. All this responses reduce urine production and stimulate water reabsorption in the distal nephron, thus concurring in the antidiuretic mechanisms; being this responses activated by blood volume reduction and increased plasma osmolality (occurring in the diuresis phase), it is possible that they are not (or not principally) directly affected by ethanol levels. All the studies examined are made on healthy volunteers and not on experimental animals, so it is not possible to suppress the reflex mechanisms of blood volume control to determine ethanol direct contribution to the activation of these pathways. The antidiuretic mechanisms activated in this phase are so strong that no reliable augment in diuresis is induced by drinking large amounts of water (20 mL/kg). In this phase there is therefore an increase in blood volume, reduction of osmolality to normal or slightly low values (280) and relative hyponatriemia, for augmented dilution, and hypokaliemia, for increased excretion, induced by mineralcorticoid activity. The activation on the mineralcorticoid system is enhanced by ethanol in the same way shown on the posterior pituitary, as verified on rat brain (Acute alcohol administration stimulates the activity of hypothalamic neurons that express corticotropin-releasing factor and vasopressin, 1996. ): in the second phase both ADH and CRH secretion increase. The antidiuresis phase could explain the prevalence of hypertension in chronic drinkers and ethanol-addicts, as well as the ipokaliemia. Role of plasma vasopressin in changes of water balance accompanying acute alcohol intoxication, 1995. Alcohol stimulation of renin release in man: its relation to the hemodynamic, electrolyte, and sympatho-adrenal responses to drinking, 1985. Plasma immunoreactive atrial natriuretic peptide and vasopressin after ethanol intake in man, 1992 immunoreactive atrial natriuretic peptide and vasopressin after ethanol intake in man. The introduction of ethanol metabolism is closely related to the metabolic pathways of carbohydrates and glucose, the metabolite of ethanol, acetyl CoA, enters in the process of glycolysis. This is important because it allows you to convert almost all chemical substances into energy. The reaction proceeds in three steps, characterized by a different production / energy expenditure, according to the law of Gibbs. If the metabolism of ethanol is complete, we will have an exothermic event with release of 1325 kJ / mol of energy. If the reaction stops early due to urinary elimination of acetic acid, the energy derived from alcohol is only 215.1 kJ / mol. It is important to remember that the first step involves an energy consumption of about 3ATP for each ethanol molecule. Our body produces everyday about 3 g of ethanol by fermentation processes for the synthesis of fatty acids, glycerolipid metabolism and biosynthesis of bile acids. It is therefore appropriate to consider as normal the presence of catabolism systems in our body able to prevent accumulation and toxicity typical of alcohol. Enzymes involved in ethanol metabolism can be found in various tissues and organs, but primarily, they are located in the liver and kidneys, and for this reason appear to be the main metabolic sites, as well as major damaged from toxic metabolites (eg. acethaldeide). from ethanol to acethaldeide: alcohol dehydrogenase. Ethanol is oxidized to acethaldeide by the enzyme alcohol dehydrogenase IB class I, beta polypeptide ADH1B. The gene encoding this enzyme is located on chromosome 4 locus 4q21-q23. The reaction catalyzed is the following: alcohol + NAD + ⇄ aldehyde or ketone + NADH + H. The enzyme is a protein with a zinc-finger, consisting of several homo- or hetero-dimers of subunits alpha, beta and gamma. The three genes encoding these subunits are organized as gene clusters. The enzyme acts on primary and secondary alcohol. In animals, but not in yeast, acts also on cyclic secondary alcohol. In humans and many other animals, the metabolic role is to catabolize alcohols which would otherwise be toxic. In yeast and many bacteria they catalyze the opposite reaction (formation of alcohols from aldehydes) as part of fermentation. In addition to ethanol, this enzyme is responsible for the catalysis of retinol, other aliphatic alcohols, hydroxysteroids, products of lipid peroxidation, and methanol, which is degraded particularly in formaldehyde, toxic compound known to be capable of affecting the views and large quantities lead to death, which means that the danger from ingesting methanol comes from the compound itself, but from the catalytic alcohol dehydrogenase. Another enzyme that can metabolize ethanol and CYP2E1, belonging to the cytochrome P450, which occurs when the amount of ethanol taken exceeds the capacity of the catabolic dehydrogenase. In chronic alcoholism, the activity of this enzyme is induced, which results in impaired ability of the liver to detoxify poisons. from acethaldeide to acetic acid: aldehyde dehydrogenase. Aldehyde dehydrogenase is the second most important enzyme involved in the metabolism of ethanol. In the liver there are two isoforms, cytosolic and mitochondrial, which can be distinguished by their electrophoretic properties, kinetics and their subcellular localization. The gene encoding the mitochondrial isoform (which has less km than acethaldeide) is located on chromosome 12 q24.2 locus, while the gene encoding the cytosolic form is located on chromosome 9 locus q21. Most Caucasians have isozymes, while approximately 50% of Asians have only the cytosolic form, while lacking the mitochondrial (polimorphism). The absence of mitochondrial shape may explain a higher frequency of phenomena of acute alcohol intoxication in Asians compared to Caucasians. from acetic acid to acetyl CoA: ACSS2. The enzyme involved in the transformation of acetic acid in acetilCoA is ACSS2, encodes by the gene located on chromosome 20 6.2.1.1 locus q11-22. This is a cytosolic enzyme that catalyzes the activation of acetate for lipid synthesis and energy generation. The protein acts as a monomer and produces from acetilCoA. This reaction requires ATP. The expression of this gene is regulated by sterol regulatory element-binding proteins, transcription factors required to initiate the synthesis of cholesterol and unsaturated fatty acids. For this gene were found two variants that encode different isoforms. from Acetyl-CoA to water and carbon dioxide. Metabolic changes induced by alcohol: Alcohol can cause vitamin and nutritional deficiencies. Alcohol and the immune system: the abuse of alcohol can lead to a reduction of immune defenses.